It was 1943 and World War II was raging overseas. German U-boats patrolled the Florida coast and the eastern seaboard, attacking merchant shipping, as Allied and Axis troops fought across battlegrounds in Europe and Africa. That same year a few Daytona Beach high schoolers were enjoying an idyllic summer surfing warm Florida waves. 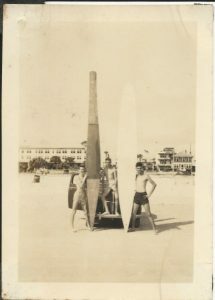 These photos were brought to the attention of the museum by Cocoa Beach resident, Wayne Shear. Wayne is the young surfer in the center. The two surfboards appear to be Blake-type hollow boards. You can just make out the faded outline of the one on the right, which was probably painted white. 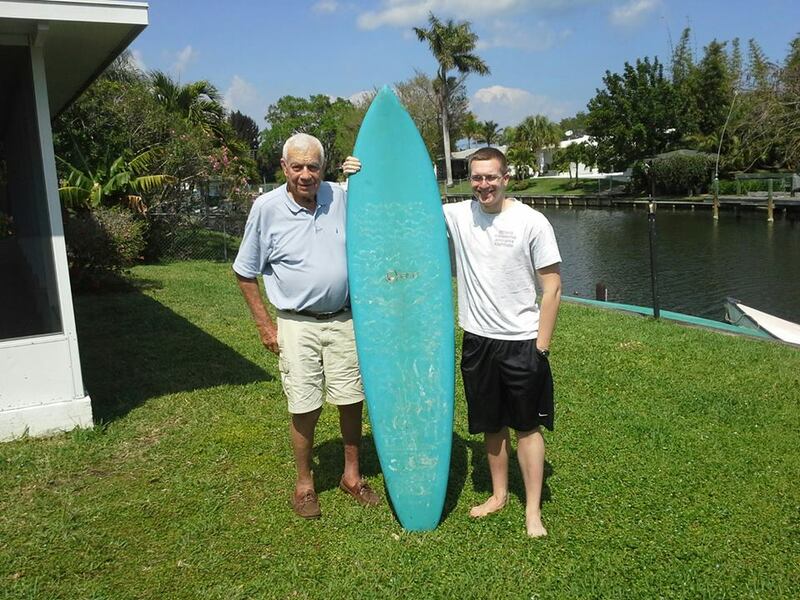 Mr. Shear, who is is 88 years young, says he remembers little about that time except they surfed that one summer and never saw any other surfers. 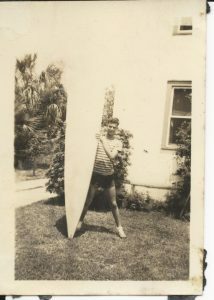 Mr. Shear enlisted in the Navy the following year and never resumed surfing. It seems remarkable that he saw no other surfers around since Daytona Beach was the hub of surfing activity during the 1930s. In the book Surfing Florida, by Paul Aho and Ron Faulds, it states “Daytona Beach bred its own crew of pioneers in the 1930s. By the time its earliest surfers reached high school age almost ninety Blake-style hollow boards had been built in the shop classes of Mainland and Seabreeze High Schools. The beaches of Daytona boasted as many as fifty regulars in the years leading up to World War II.” The key is the start of the World War. As Mr. Shear stated, “When you turned 18 you either enlisted or got drafted.” America was at war, and surfing in Florida and across the beaches of America went into hibernation. I met with Mr. Shear at his Cocoa Beach home to return his photos. We talked over a beer, mostly about our Navy experiences, while his grandson, Jack, listened in. Afterwards he took me into the garage to inspect a stack of surfboards that are kept on hand for family to use when they come to visit. One that caught my eye was a blue single fin that, on closer inspection, turned out to be a vintage O’Hare surfboard from the early 70s. Mr. Shear graciously offered to donate it to the museum and I gladly accepted. It is always exciting to add a new surfboard or memorabilia to the museum collection, but what is most rewarding is discovering the stories that add richness and depth to Florida surfing history.